A Frolic through Time: Goldwork-Embroidered Petticoat: The Swags Are Done! 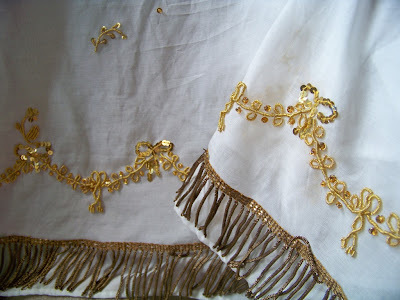 Goldwork-Embroidered Petticoat: The Swags Are Done! Here debuts the new bottom-of-the-petticoat. 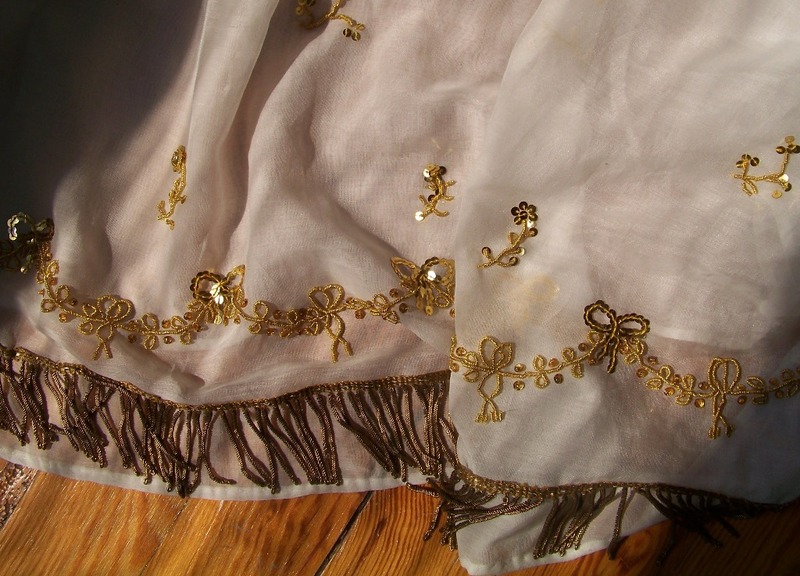 The last stitches went into the goldworked swags last evening, and I sighed a long sigh. That was a pleasant, slow, mosey-speed project, handling tiny spangles and wriggles of purl, and wee gold beads that glowed and sparkled like caught rays of sunlight. Completed goldwork swags of leaves, abstract flower elements, and bows. 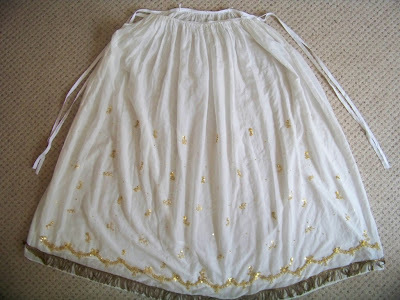 The full petticoat as it stands -- lays -- now. Here's how it looks when hung up. A little more elegant than mashed out on the floor, eh? 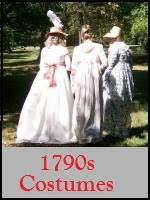 The petticoat is meant to hang narrowly down the body. The spangles, in particular, catch sunshine, and I hope, candlelight. 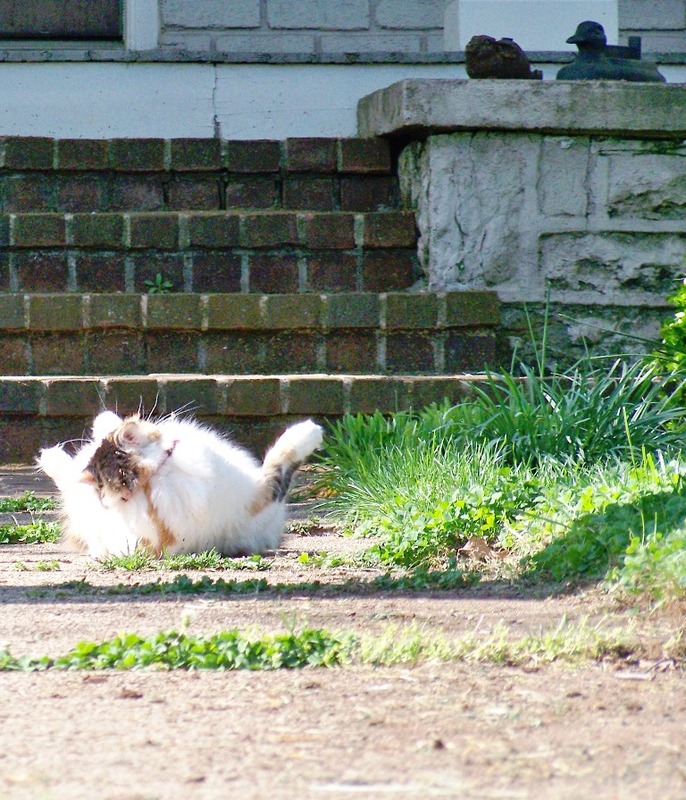 Checking to see what the elements do when caught by the sunshine. On a whim I took out the gown it was designed for and laid it in place. 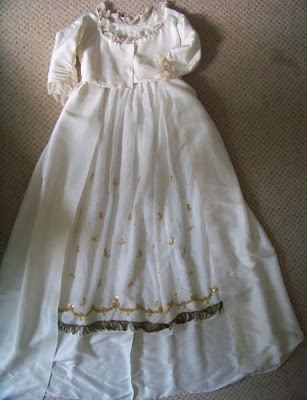 The gown is trained, so the petticoat sits up high in it, reminding me of a doll's dress. Perhaps I'll do a photo shoot, perhaps...wouldn't it be neat to see how it looks on? I haven't tried it yet! What's next on the horizon? A breather from this project, I think. 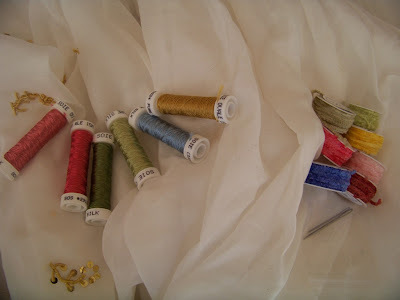 The next phase is to build out the swags with interwoven elements in silk chenille and flat silk (ovalle) thread. The design is taking shape slowly, but it shouldn't be rushed. Probably a couple of thoughts will be sketched and then mulled and chewed on until one of them, or a combination of them, hits as being right. 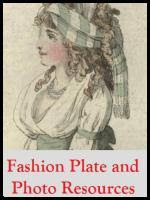 To help, I am gathering extant examples and designs on a Pinterest 18th Century Embroidered Garments board. Meantime, that little sleeveless spencer is calling! ...our crabapple tree, in full blow. Unaccountably it reminds me of the petticoat. It isn't gold, and the blossoms aren't artificially swagged, yet, there is something the two share. A controlled palette? Out and out luxe? A person can't stay on the philosophical heights too long. Here is a more appropriate ending. That round ball of mostly tummy is Blueberry Muffin, looking super-sized, rolling in joy, or is she just trying to scrape off that heavy fur? Oh, wow. That is beautiful, you've done a wonderful job! this is really lovely! do you mind my asking how many yards of purl you bought? i am trying to figure out how much i should be buying for my wedding gown, which will be embroidered all around the entire hem, sleeves, and neckline... right now i'm planning on using passing threads because i can buy it by the spool, and spangles, plus the soie ovale. This will be a "wow", "looklooklook" and "want" post! First, your petticoat is so amazingly beautiful! This was really worth all the extra work, it looks truly like an extant garment! Very well done!!! 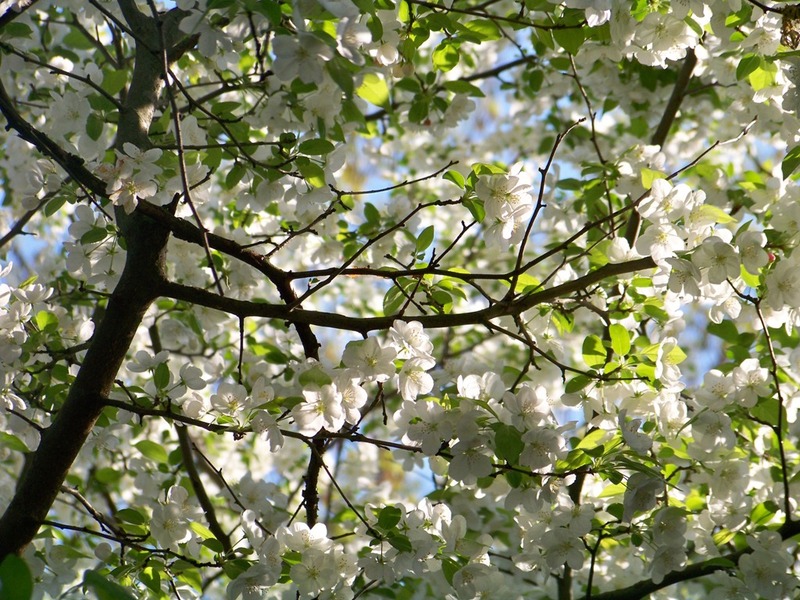 And yes, it looks light and lovely like the blossoms on the crabapple tree! 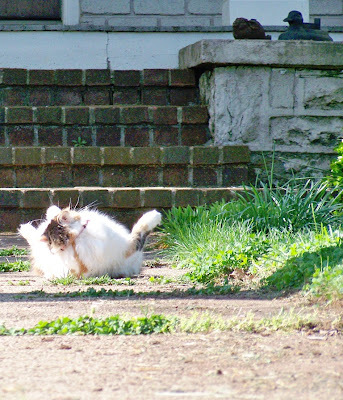 And - aaawwwwwww - kitty bathing in the spring sun, too cute!!! Thank you all! 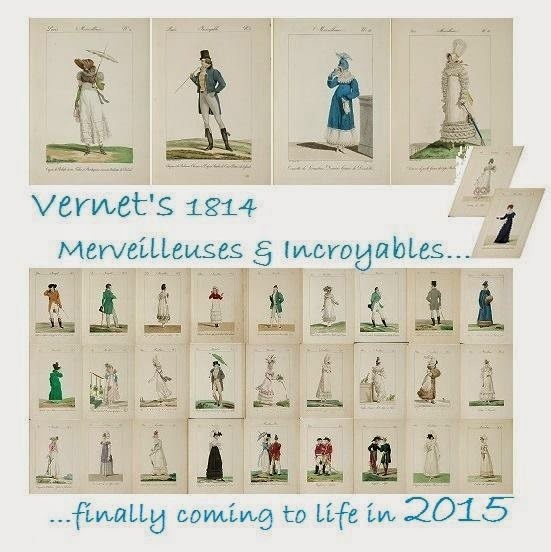 It was such fun to hang it up and see it all at once, not just the portion that showed on the embroidery frame. Samantha B., you asked about yardage of purl used. Good question! I am guessing about two yards was used for the swags. For the individual elements? That's a different tale, because they are not done. I used about two yards there, but the leaves need filling in with purl, and that eats yardage. What I'd do is purchase a yard, then do a sample of one motif, and estimate how much was used and measure how much is left. Then a second motif, if different, and estimate again. It that gets too expensive, do a motif in thick thread, and measure the same way. You will have some waste, for sure: sometimes the purl pulls out and is ruined, and you will end up with some bits and drabs. But wait, you are talking about using passing thread. Hmmm. To get a similar "thick" effect, you will probably have to do two threads and couch them down next to each other...doubling the amount you need. You might want to check the effect by looking at Mary Corbet's Needle 'n Thread. Very best, and what a wonderful project that will be! How lovely! I applaud you! Glorious and happy-making! Hoorah for hand work!! what size spangles did you use? Sure thing; glad to help in any way! Elizabethan twist is realllly pretty. The silver will add such a good glow. As for the spangles, I used 4mm spangles. They are just right for detail work. They are, however, not real. I priced them and would have spent $40+ on them. No go for a first project. Very best and do tell us how the project goes! Happy-making indeed! It's been my favorite-ever project. Nuts, if I could get someone to sew gowns for me, I'd do fly fringe and knotting and embroidery and beading and so on all the time. I used to bead, too, so these skills are old friends. Thank you! It was enjoyable to make and I look forward to finally wearing it, possibly this summer. Had a look at your blog. Love trims: neat!